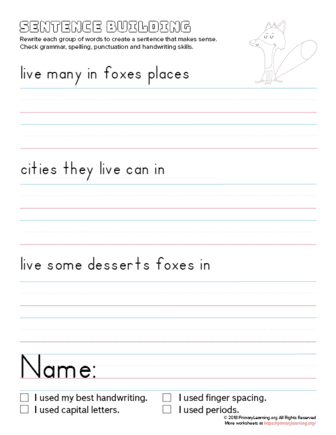 In this activity students rewrite each group of words to create a sentence that makes sense. All three sentences about the fox are out of order and miss the punctuation and capitalization. Students gain valuable practice with grammar, spelling, punctuation, capitalization and handwriting skills. Enjoy it? Share with your friends!